In honor of their first ever Readers issue, Runner’s World is asking their readers: Why do you run? 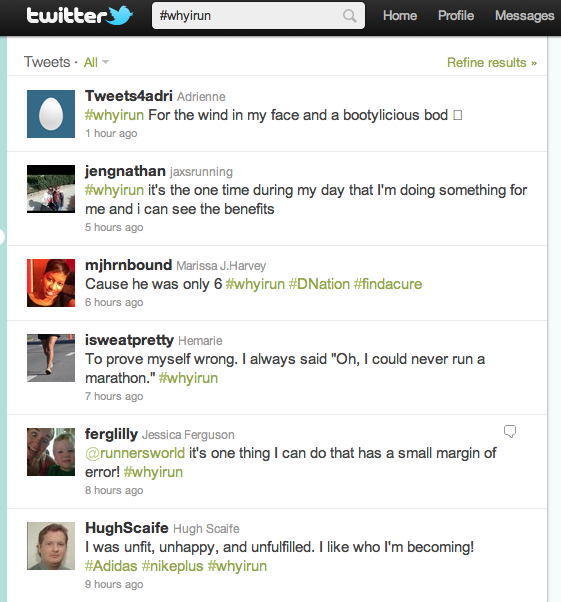 Using the hashtag #whyirun, you can answer the question on Twitter. The answers are awesome, ranging from the hiliarious (@TweetinTommyC: I run because I’m not going to let two perfectly good and functioning legs go to waste and @OhshititsAilish:To prepare myself for the zombie apocalypse) to the thought-provoking (@NurseHillRuns: I love to let my heart race). I run for a lot of reasons. The first reason that came to mind (which I tweeted) was that I run to prove myself wrong. I remember living on 51st street between 4th and 5th Ave in New York City and walking to the end of the block to see the New York City Marathon runners go by. I used to think to myself, “Wow, these people are amazing. I could never do that.” I’m wrong a lot in life (my boyfriend will be excited to see that I admitted to it in a public forum) and this is one of those times where I’m happy about it. When I run the Walt Disney Marathon in January, I will be proving myself wrong and will be darn proud of it. I also run to stay healthy and to stay sane. I run because I love the camaraderie. I run to enjoy cake and cookies without feeling guilty. Tell me, why do you run? I love this idea, I’ll make sure to check it out on Twitter. I run to prove to myself that I can do anything I set my mind to. That high you get when you finish a long run, it’s so addicting. At that point I feel like I can conquer the world. Ha! I feel like my reasons for running change on a daily basis. Sometimes it’s to push myself, to have some alone time, because I can…etc.